Stepping into Kyoto Garden Sushi is like stepping through a portal and entering another world: One where the frenetic energy of Kloof Nek road recedes, giving way to the zen of the Japanese restaurant that has long been the favourite of both locals and foreigners alike. While their sushi and other seafood delicacies are firmly cemented in history as some of the very best, and well-awarded in South Africa, their brand new Shichirin Grill offering is a novel addition. 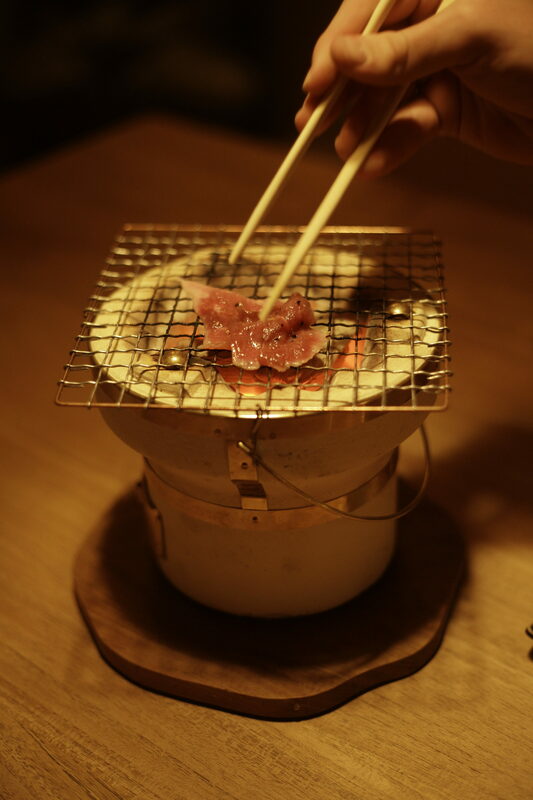 Owner Scott, imported just a handful of the tiny grills directly from Japan, along with the ancient Binchōtan charcoal that sets them aglow. The result? 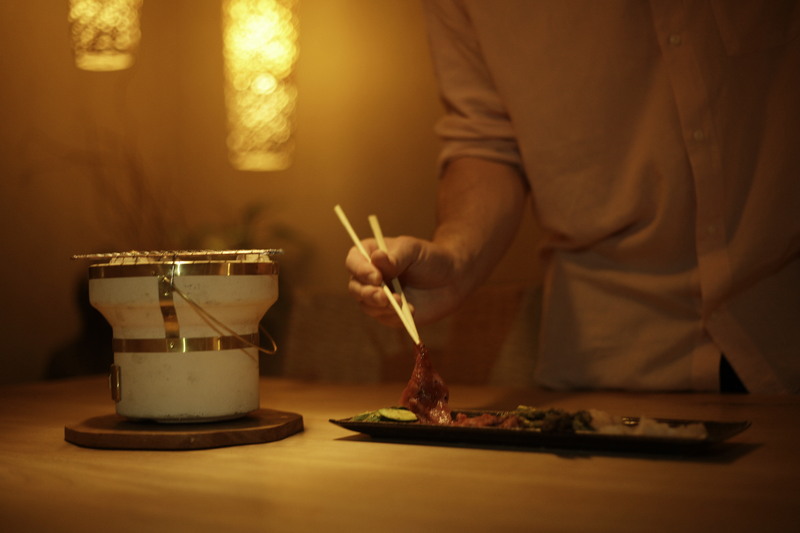 An incredible, interactive dining experience that is both entertaining and tasty. As the grill is the main event, we recommend easing into the pace of things with a couple of starters. The tuna belly tartare was incredible, flavoursome without being fatty, served alongside the popping dark green of seaweed. There is also ceviche. Slices of white fish (the catch of the day) are marinated in lime, a tiny sprinkling of micro leaves calling attention to the delicate balance of tang and texture. If you like a good broth, do not skip Kyoto’s. The miso and noodle brew is temptingly slurp-able alone, but studded with bamboo, mushrooms, and spring onion, it enters a new realm of depth. Onto the fiery part of the evening. The little grill was placed alongside our table, and right there in front of us, delicate spears of asparagus, slithers of duck, wagyu beef, plump scallops and pink prawns all had their turn, our expert waiter turning each piece until it was gently seared but not scorched (guests can also cook a portion of their own dinner). There are no frills or sauces needed, such is the subtly smoky flavour imparted from the controlled heat and charcoal – each tiny morsel enjoyed with relish. As the Japanese menu focuses on light flavours, it means that there is room for dessert. And that is a wonderful thing, because Kyoto is famed for their ice-cream. A black sesame, miso, and even a matcha scoop were presented (there is also a new vegan option). As we are fans of all things sweet and lovely, we could not resist the matcha crepe, and tearing into the papery-thin, green-tea imbued dessert did not prove disappointing. House-made chocolates completed the perfect meal, leaving us full without feeling heavy – the marker of a great Japanese dining experience. Sparkling green tea or ginger and gin cocktails, a wine list of the very best boutique South African vino (we love the Remhoogte Honeybush Chenin Blanc), sake, and Japanese whisky (served poured over glacier ice) all populate the beverage list in an array that never fails to impress. Your attentive waiter will no doubt advise as to what to pair with your chosen feast, should you need some guidance. Kyoto Garden Sushi is open Monday to Saturday, 5.30pm-11pm. Call +27 21 422 2001 to make a reservation, or use the Dineplan link on their website.